There is healing process that many people go through following a death. Grief is a personal emotion and everyone deals with in their own way. For most, the cycle begins with the installation of a burial marker like gravestones or cemetery plaques at the location where the deceased is laid. The feeling of disbelief at the loss is often set aside once the marker is in place. These items provide the first bit of closure by creating a solid reminder that someone has passed as well as providing a memorial that may be visited whenever comfort is needed. For many people, both of these things are extremely important to begin accepting the reality and coping with their grief. Markers are a type of monument created as a permanent testament to an individual's life. They contain the name of the person whose body rests in the plot, as well as the dates on which they were born and passed away. 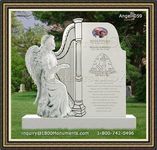 Many people also choose to include epitaphs or decorative engravings and designs. A plaque of this type can come in many sizes, styles and shapes. They may be completely flat or they might have the text engraved into them or it could be raised for a bit of dimension. Just how conservative or ornate the design is depends mainly on what the family desires. Several different materials can be used for their construction. The most popular choice is bronze because of its durable properties, easy casting and beautiful appearance. Other substances such as stainless steel, brass, slate, granite and marble are also commonly used for this purpose. Generally, the wishes of the one making funerary decisions are the primary factors when choosing a design, though they are not the only considerations. Many interment facilities set guidelines and restrictions on the size and styles allowed for installation. An area's climate will also affect which materials are acceptable.